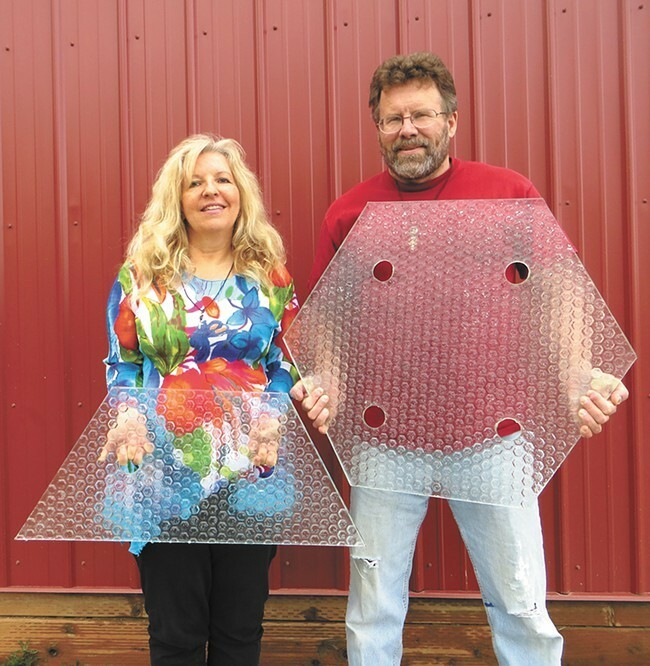 The city of Sandpoint will soon see a 150-square-foot surface built out of solar panels as part of a pilot project with Solar Roadways Inc., the startup company that's been developing the panels to replace cement on roads, sidewalks and parking lots. Thanks to $48,734 in grant money from the Idaho Department of Commerce and another $10,000 from the Sandpoint Urban Renewal Agency, Solar Roadway co-founders Scott and Julie Brusaw's much anticipated solar energy project is getting its first public test run. The Brusaws are donating installation costs for the project that is expected to be completed this June, according to the city's grant application. The plan is to install the green and purple hexagonal panels made from tempered glass at the Jeff Jones Downtown Square in Sandpoint. Although Brusaw, who has received three rounds of funding from the U.S. government in addition to more than $2 million in donations from a kickstarter campaign, has built a parking lot near his secluded Idaho home, this is the first public installation. "During the day ... I'm selling power back to the power plant," Brusaw told the Inlander last year of the solar panel surface on his property. "Then, of course, at night when the sun's not shining, I draw it back off." The panels have LED lights, little heaters and solar panels inside. The lights could theoretically be used to mark lines on the road and the heaters would come in handy for keeping roadways clear of snow and ice. Brusaw says the panels have been tested to withstand 250,000 pounds of pressure. The Netherlands built the world's first solar bike path in 2014 — about 75 yards long. In six months it has generated enough electricity to power a small household for a year. France is also considering installing 621 miles of solar panels over the next five years, according to Ségoléne Royal, the minister of ecology and energy. And a German company, Solmove, is looking to install solar panels on German roads.